Mark your calendars! There are two opportunities to come out and get involved with the Southern Queens Greenway. After a successful walk in August (see our photos here) we’ll have our second Walk the Conduit on Saturday, September 19th. Same place and same time. 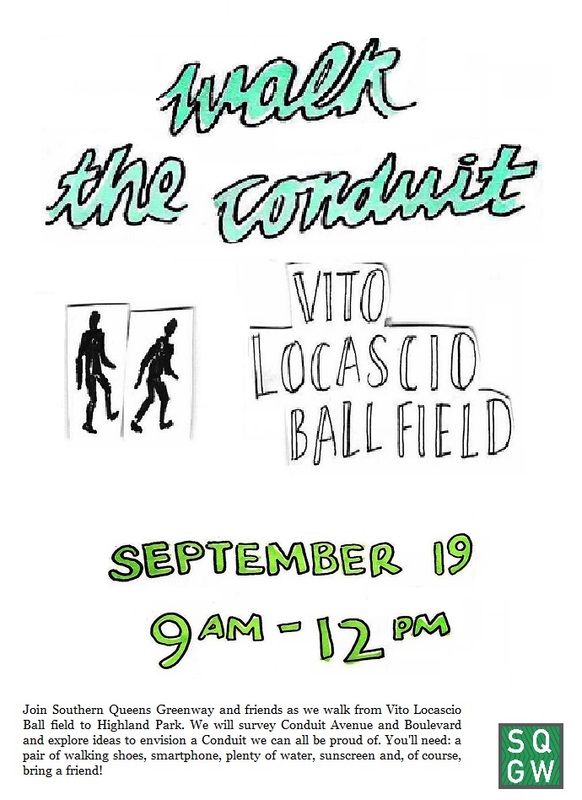 Remember to bring good walking shoes, plenty of water and, of course, a friend! 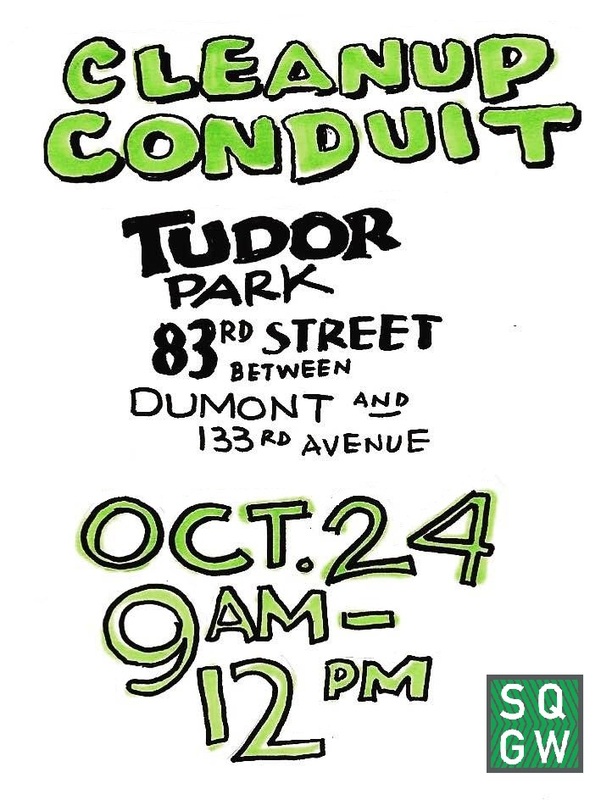 On Saturday, October 24th, at 9am Southern Queens Greenway and friends will host a neighborhood cleanup at Tudor Park. Get ready to clean up some trash with awesome people. It’ll be a great event and we’ll have a little party afterwards to celebrate all of our hard work. Parent supervision is required for participants under 18 years old. If you know anyone who would like to get their hands dirty and wants to do some community service before Halloween this is a great opportunity. If you are from an organization or business that would like to partner up or would like to donate please use the Contact Us page to reach us. Transportation Alternatives Queens Activist Committee [TAQAC], a partner organization doing great activist and Complete Streets work in the borough, recently established a sub committee, “Eastern Queens Meetup,” to address pedestrian, public transportation and cycling issues of Eastern Queens. The initial November meeting, held in Bayside, NY, revealed that many Queens and Nassau residents were interested in strengthening the pedestrian, bike and public transit near outer lying parts of New York and there is work to be done in both the South and East. The following meeting for Eastern Queens Meetup is January 14th, second Wednesday of the month and future meetings will meet monthly. Check back again for the location and time. For Eastern Queens Meetup there are two proposed meeting locations to accommodate NYC’s largest borough: Jamaica and Flushing.The committee is seeking public spaces that can accommodate roughly 20-30 people and preferably walking distance from the LIRR and/or MTA subway stops. If you, a family member or a friend know of any locations please leave a comment in the section below or refer to the contact page to reach the site administrator. Thanks for your support.